As 2009 is fast approaching an end it is worth asking whether this also means an end to the financial and economic crisis. Even if 2009 will be a year thoroughly marked by a global recession it could still seem as if the worst is behind us. Most of the advanced world swung into positive growth rates in H02 2009, risky assets have rallied, volatility has declined to pre-crisis levels, and interest rates and fiscal stimulus have been adeptly deployed to avert catastrophe. However and precisely because the last part has been a crucial prerequisite for the first three and as policy makers are now adamant that emergency measures must be scaled back or abandoned either because of necessity or a balanced assessment, it appears as if Churchill's well known paraphrase is an adequate portrait of the situation at hand. In this way, what is really left in the way of global growth once we subtract the boost from fiscal and monetary stimuli and what is the underlying trend growth absent the crutches of extraordinary policy measures? This question is likely to be a key theme for 2010. Nowhere is this more relevant than in Greece and Spain who, together with Eastern Europe, have slowly but decisively taken center stage as focal points of the economic crisis. With this change of focus a whole new set of issues have emerged in the context of just how efficiently (or not) the institutional setup of the Eurozone and EU will transmit and indeed endure the crisis. I won't go into detail on this here mainly because I would simply be playing second fiddle to what Edward has already said again (and again) in the context of his ongoing analysis of the Spanish and Greek economy to which I can subscribe without reservations. It will consequently suffice to reiterate two overall points in the context of Spain and Greece. Firstly, the main source of these economies' difficulties, while certainly very much present in the here and now, essentially has its roots in population ageing and a period, too long, of below replacement fertility that has now put their respective economic models to the wall. It is interesting here to note that while it is intuitively easy to explain why economic growth and dynamism should decline as economies experience ongoing population ageing, it is through the interaction with public spending and debt that the issue becomes a real problem for the modern market economy. Contributions are plentiful here but Deckle (2002) on Japan and Börsh-Supan and Wilke (2004) on Germany are good examples of how simple forward extrapolation of public debt in light of unchanged social and institutional structures clearly indicate how something, at some point, has to give. Whether Spain and Greece have indeed reached an inflection point is difficult to say for certain. 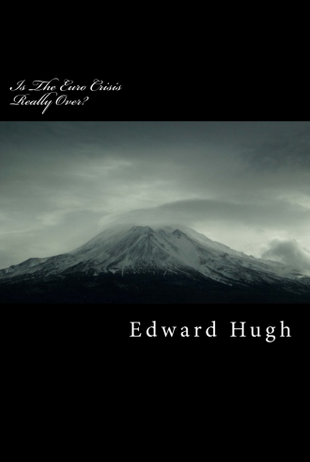 However, as Edward rightfully has pointed out, this situation is first and foremost about a broken economic model than merely a question of staging a correction on the back of a crisis. Secondly and although it could seem as stating the obvious, Greece and Spain are members of the Eurozone and while this has certainly engendered positive economic (side)effects, it has also allowed them to build up massive external imbalances without no clear mechanism of correction. Thus, as the demographic situation has simply continued to deteriorate so have these two economies reached the end of the road. In this way, being a member of the EU and the Eurozone clearly means that you may expect to enjoy protection if faced with difficulty, but it also means that the measures needed to regain lost competitiveness and economic dynamism can be very tough. Specially and while no-one with but the faintest of economic intuition would disagree that the growth path taken by Greece and Spain during the past decade should have led to intense pressure on their domestic currencies, it is exactly this which the institutional setup of the Eurozone has prevented. I have long been critical of this exact mismatch between the potential to build internal imbalances and the inability to correct them, but we are beyond this discussion I think. Especially, we can safely assume that the economists roaming the corridors in Frankfurt and Brussels are not stupid and that they have known full well what kind of path Greece and Spain (and Italy) invariably were moving towards. Essentially, what Greece and Spain now face (alongside Ireland, Hungary, Latvia etc) is an internal devaluation which has to serve as the only means of adjustment since, as is evidently clearly, the nominal exchange rate is bound by the gravitional laws of the Eurozone. Now, I am not making an argument about the virtues of devaluation versus a domestic structural correction since it will often be a combination of the two (i.e. as in Hungary). What I am trying to emphasize is simply two things; firstly, the danger of imposing internal devaluations in economies whose demographic structure resemble that of Greece and Spain and secondly, whether it can actually be done within the confines of the current political and economic setup in the Eurozone. On the last question I personally adamant that it has to since failure would mean the end of the Eurozone as we know it but this is also why I am quite worried, and intrigued as an economist, on the first question. Specifically and as Edward and myself have been at pains to point out (and to test and verify) this medicine while certainly viable in theory has three principal problems. Firstly, it takes time and may thus amount to too little too late in the face of an immediate threat of economic collapse. Secondly, an ageing population spiralling into deflation may have great problems escaping its claws, and thirdly, because of the pains associated with the medicine the patient may be very reluctant to acccept the treatment. Especially, the last point is very important to note from a policy perspective and was made abundantly clear recently in the context of Latvia where The Constitutional Court ruled that the very reforms demanded in the context of the IMF program to reign in costs through cutting pensions would violate the Latvian constitution. 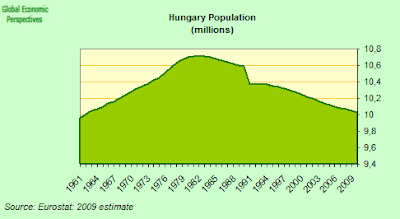 And as Edward further points out, the situation is the same in Hungary where voters recently (and quite understandably one could say) decided to reject a set of health charges that were exactly proposed as part of a reform program designed to reign in public spending. We are about to see just how willing Spain and Greece are in the context of accepting the austerity measures that must come, but similar dynamics are not alltogther impossible. 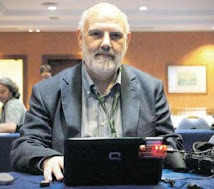 Consequently, and while I agree with Edward as he turns his focus on the inadequacy of the political system in Spain and Greece to realize the severity of the mess; it remains an inbuilt feature of imposition of internal devaluations through sharp expenditure cuts that they are very difficult to sustain given the political dynamics. This is then a question of a careful calibration of the stick and carrot where the former especially in the initial phases of an internal devaluation process is wielded with great force. Internal Devaluation, What is it All About Then? If the technical aspects of an internal devaluation have so far escaped you it is actually quite simple Absent, a nominal exchange depreciation to help restore competitiveness the entire burden of adjustment must now fall on the real effective exchange rate and thus the domestic economy. The only way that this can happen is through price deflation and, going back to my point above, the only way this can meaningfully happen is through a sharp correction in public expenditure accompanied with painful reforms to dismantle or change some of the most expensive social security schemes. This is naturally all the more presicient and controversial as both Spain and Greece are stoking large budget deficits to help combat the very crisis from which they must now try to escape. Positive productivity shocks here à la Solow's mana that fall from the sky may indeed help , but in the middle of the worst crisis since the 1930s it is difficult to see where this should come from. Moreover, with a rapidly ageing population it becomes more difficult to foster such productivity shocks through what we could call "endogenous" growth (or so at least I would argue). With this point in mind, let us look at some empirical evidence for the process of internal devaluation so far. In order to establish some kind of reference point for analysis I am going to compare Greece and Spain with Germany. This is not because Germany, in any sense of the words, stands out as an example of solid economic performance as the burden of demographics is clearly visible here too. However, for Spain and Greece to recover they must claw back some of the lost ground on competitiveness relative to Germany. This highlights another and very important part of the internal devaluation process. Spain, Greece etc will not only be fighting their own imbalances; they will also fight a moving target since they may not be the only economies who face deflation or near zero inflation as we move forward. Beginning with the simple overall inflation rate measured by the CPI we see that the level of prices (100=2005) has risen much faster in Greece and Spain than in Germany. Compared to 2005 the price level in Germany stood 7.1% higher in Q3-09 which compares to corresponding figures for Spain and Greece at 11.5% and 10.3% respectively. However, this does not tell the whole story about the build up of imbalances since the inception of the Eurozone. Consequently, since Q1-00 the price index has increased some 15% in Germany whereas it has increased a healthy 29.3% and 27.2% in Greece and Spain respectively. Turning to the bottom chart which plots the annual quarterly inflation rate a similar picture reveals itself with a high degree of cross-correlation between the yearly CPI prints, but where the German inflation rate has been persistently lower than that of Greece and Spain. The average inflation rate in Germany from Q1-1997 to Q3-2009 was 1.6% and 3.5% and 2.8% for Greece and Spain respectively. It is important to understand the cumulative nature of the consistent divergence in inflation rate since it is exactly this feature that contributes to the build-up of the external debt imbalance. From 2000-2009(Q3) the accumulated annual increases in the CPI was 57% for Germany versus 109.4% and 104% for Greece and Spain respectively. Assuming that Germany remains on its historic path of annual CPI readings (which is highly dubious in fact), this gives a very clear image of the kind of correction Greece and Spain needs to undertake in order to move the net external borrowing back on a sustainable path which in this case means that these two economies are now effectively dependent on exports to grow. If the divergence in Eurozone CPI represents a general measure of the built-up of external imbalances and the need for an internal devaluation through price deflation two other measures provide more direct proxies. These two are unit labour costs and the producer price index (PPI) which are both key determinants for the competitiveness of domestic companies on international markets. Intuitively one would expect unit labour costs as an important input cost to drive the PPI which measures the price companies receive for their output. Yet this is only going to be the case if the companies in question have market power on the domestic market. Consequently, if you regress the quarterly change of the PPI on the quarterly change on unit labour costs you get a negative coefficient in Germany and a positive coefficient in Greece and Spain (highly significant for Spain and not so for Greece). This is exactly what one would expect since German companies are highly exposed to the external environment (where they enjoy no market power) and thus has to suffer any increase in the cost of labour input through a decline in their output price. Conversely in Spain, the connection between an increase in unit labour costs and the PPI is strongly positive which suggest that Spanish companies has enjoyed considerable market power due to a vibrant domestic economy . It is exactly this that must now change. If we look at unit labour costs and abstract for a minute from the increase in German unit labour costs from Q2-08 to Q2-09 in Germany , both Greece and Spain have seen their labour cost surge relative to Germany since the inception of the Eurozone. Since Q1-00 the accumulated change in the German index has consequently been 15.2% which compares to 97.7% and 105.6% for Greece and Spain respectively. More demonstratively however is the fact that since the second half of 2006 the labour cost index of Spain and Greece have been above the Germany relative to 2005 which is the base year. Consider consequently that the labour cost index in Greece and Spain was 13.3% and 16.4% below the German ditto in Q1-2000 and now (even with the recent surge in German labour costs), the Greek and Spanish labour cost index stands 7.2% and 5.2% above the German index. Turning finally to producer prices the similarity between the three countries in question are somewhat restored which goes some way to support the notion of persistent lower labour cost growth relative to fellow Eurozone members as the main source of the build-up of Germany's "competitive advantage" and in some way the build-up of intra Eurozone imbalances. Essentially, and while definitely noticeable the divergence between Greece/Spain and German on the PPI is less wide than in the context of unit labour costs and the CPI. Consequently, and if we look at the index, the divergence which saw Spanish and Greek producer prices increase beyond those of Germany came very late in the end of 2007. Moreover, the correction so far has been quite sharp in both Greece and Spain relative to Germany with the PPI falling 14.8%, 5.7% and 2.8% (yoy) in Q2-09 and Q3-09 in Greece, Spain and Germany. The accumulated increase however, in the PPI, from 2000 to Q3-09 has been 85% in Germany and 136% and 101.7% in the Greece and Spain respectively. If the numbers above indicates the extent to which intra Eurozone imbalances have manifested themselves in divergent price levels and rates of inflation, the concept of internal devaluation concerns the net effect on the prices in Greece and Spain relative to, in this case, Germany. On this account, and if we put the beginning of the financial crisis as Q3-07 (i.e. when BNP Paribas posted sub-prime related losses) the butcher's bill look as follows. From Q3-07 to Q3-09 and in relation to the CPI the average quarterly inflation rate in Greece in Spain has been 1% and 0.66% higher than in Germany. The accumulated excess inflation rate over the German inflation has been 8% in Greece and 5.29% in Spain. Only in the context of Spain do we observe some indication of the initial phases of a relative internal devaluation as Spain has seen an accumulated inflation rate lower than that of Germany to the tune of 1.28%. Turning to unit labour costs the picture changes quite a lot depending on the time horizon. Using the same period as above, the average quarterly excess increase in unit labour costs of Greece and Spain relative to Germany has been 1.75% and 0.3% in Greece and Spain respectively. The accumulated increase in unit labour costs has consequently been a full 14% and 2.8% higher in Greece and Spain relative to Germany. However, if we focus the attention on the period from Q4-08 to Q2-09 and due to the fact that labour hours in Germany have gone down further than in Greece and Spain, labour costs have corrected sharply in Greece and Spain relative to in Germany to the tune of -5.2% and 13.7% (accumulated) and -1.7% and -4.6% respectively. The fact that German producers have so far cut down sharply on labour hours could mean that Germany should claw back some of the lost ground vis-a-vis Greece and Spain if and when these two economies follow suit. Finally, in relation to producer prices the picture is very much the same as in the context of unit labour costs with the notable qualifier that the relative excess deflation observed in Greece and Spain from Q4-08 and onwards is likely to be less "technical" and thus more "real" than in the case of labour costs. In this way the period Q3-07 to Q3-09 saw the excess rate of produce price inflation reach 14.8% and 6.8% (accumulated) and 1.8% and 0.8% (quarterly average) in Greece and Spain respectively. However, if we focus the attention on Q4-08 to Q3-09 the picture reverses and reveals a substantial degree of excess deflation over the Germany PPI in Greece and Spain to the tune of 16.1% and 5.2% (accumulated) and 5.4% and 1.7% (quarterly average) for Greece and Spain respectively. As we exit 2009 it is quite unlikely that we will also be able to leave behind the effects of the economic and financial crisis and this is not about me being persistently negative or even a perma-bear. Things have definitely improve and much of this improvement owes itself to rapid, bold, and efficient policy measures. However, some economies are in a tighter spot than others and this most decisively goes for Spain and Greece who now have to correct to the fundamentals of their economies with rapidly ageing populations. As this correction largely has to come in the form of an internal devaluation the following conclusions are possible going into 2010. The extent, so far, of the internal devaluation process depends on the time period used for analysis. Using Q3-2007 as the beginning of the economic crisis suggest that Greece and Spain have not corrected relative to Germany as a benchmark. However, if we look entirely at the worldin a post-Lehmann context the picture is different with Greece and Spain having observed excess deflation relative to Germany to the tune of -1.7% and -4.5% respectively for unit labour costs and -5.4% and -1.7% respectively for the PPI. In this sense, 2009 will not go down as the end in any sense of the word, but more likely as the end of the beginning. - Naturally, this argument assumes non-sticky prices and thus a 1-to-1 relationship in time between a change in input costs and output prices of companies. Since contractual arrangements are likely to make both sticky in the short run and likely with divergent time paths too, the quantitative results are not robust. The results for Germany are significant at 10% whereas those for Spain are significant at 1%. Mail me for the estimated equations if you really want to see the results. - The index rose 7.8% over the course of the year ending Q2-2009 which is way above 3 standard deviations of the "normal" annual change in the index from 1997 to 2009. The explanation is really quite simple and relates to the fact that German manufactures (in particular) has sharply cut overtime work and short time work has been rapidly extended (see e.g. 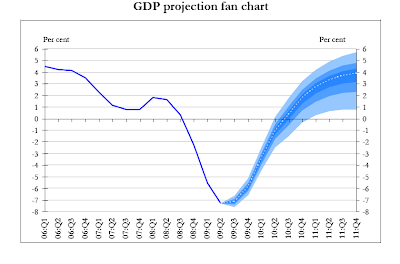 this from Q2-09) which is obviously not the case in Greece and Spain. The fact that German producers have so far cut down sharply on labour hours means that Germany should claw back some of the lost ground vis-a-vis Greece and Spain if and when these two economies follow suit. But first some really tiresome (but important) details on the ECB, since the bank effectively wound up its anti-crisis program of extraordinarily long-term lending to banks last week with a final one year funding operation that is likely to keep short-term euro interest rates ultra-low at least for another six months. The general opinion is that the tender outcome suggested that much of the banking system can now live without the ECB's life-support mechanism, although a number of banks are still highly dependent on it. The ECB injected 96.937 billion euros into the banking system in the third and last of its 12-month lending operations. As in the previous two 12-month tenders, the ECB gave banks all the money they asked for. However, in contrast to earlier tenders, it said the effective interest rate wouldn't be a fixed 1%, but rather would be tied to the average rate at the main one-week refinancing operations over the next year. The general opinion is that last week's allotment - which will increase the total amount of ECB money in the market by around 14% - will keep the Euro Overnight Index Average, or EONIA (the key rate for interbank overnight money), around its recent level of 0.30%-0.35%. Actual overnight rates have barely moved from this level since the ECB's first 12-month tender - the whopping 442.24 billion euros allocated in June - created a structural surplus of money in the market (this was obviously the intention) and reduced the cost of borrowing well below the ECB's own targeted refi rate of 1%. And it is here that that tiresome little detail comes into play, since while the EONIA rate is unlikely to move from its present levels in the short term, once the funds from this first 12-month tender mature next June (thus removing much of the excess liquidity currently in circulation), the EONIA rate will in all probability start to move back towards the level of the refi target rate, which is where it normally stands. 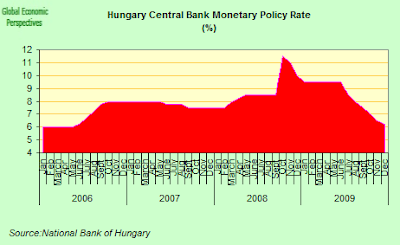 So, I want to qualify a point I made in my previous post, since this upward movement in EONIA which will be provoked by the ending of the one year funding programme will constitute some form of monetary tightening, albeit a rather marginal and insignificant one. At the same time, the recent decisions do not mean a complete termination of ECB lending operations to banks in the Eurosystem, since while the six-month tender due in March will also be the last, the three-month tenders the ECB had offered since its inception in 1999 will still continue, although it is not clear at this point whether these will have ceilings or not. Basically all these move form part of the bank's plans to end its non-standard policy measures over the course of 2010, even if it is unlikely to intentionally do anything to make matters worse for the troubled banks, provided that is, their national governments play ball with the structural reform programmes being advocated by the EU Commission. The number of banks bidding (224) was down by more than 60% on the 589 who participated in the previous 12-month operation in September, indicating that fewer banks now need such help. The banks that do remain dependent on the ECB, however, appear to be even more dependent than they were three months ago, since the average bid rose from 128 million euros to 433 million. While the ECB refuses to comment on which banks participated in the tender, it seems pretty clear that they were concentrated in countries on Europe's periphery (Greece, Spain, Ireland, possibly Austria), and indeed last month, the Greek central bank specifically urged Greek commercial banks to show restraint in the coming tender, and not increase their dependence on ECB funding. "If, for example, there are problems with the Stability and Growth Pact in one country and it can only be solved by having social reforms carried out in this country, then of course the question arises, what influence does Europe have on national parliaments to see to it that Europe is not stopped.....This is going to be a very difficult task because of course national parliaments certainly don't wish to be told what to do. We must be aware of such problems in the next few years." My considered opinion is that it is the political pressures inside those countries (whether inside or outside the Eurozone) forced down the road of internal devaluation which can ultimately cause the agreements they enter into to fall apart, ultimately leading - in the Latvian case, and as Dombrovskis recognises - to sovereign default, bringing others (in the Latvian case, Estonia and Lithuania, or in the Greek one Spain) crashing down behind them. The Constitutional Court’s ruling Monday that the decision by Latvia’s government earlier this year to lower pensions had violated the Satversme will, at the very least, force a new round of talks with international lenders and could trigger a new wave of political instability. And as we should also note, the Constitutional Court also ruled that the government’s agreement with international lenders was also unconstitutional in that it hadn’t been approved by parliament, which takes us back to Merkel's point, and the absence of institutional mechanisms for the EU - under defined circumstances - to over-ride the sovereignty of national parliaments (what a hot potato that one). 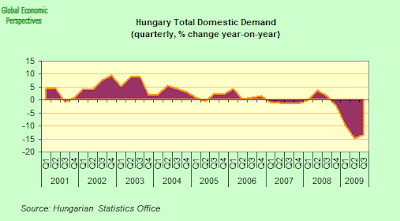 And the issue isn't simply confined to Latvia, since we should not forget that Hungarian voters held their own referendum in March last year, where they effectively threw out a set of health charges introduced by the government as part of an "austerity programme" designed to bring Hungary's surging public deficit under control. 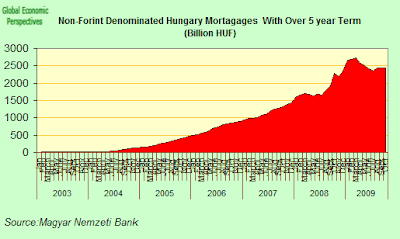 And the long term financing of Hungary's health system has still not found a satisfactory solution. "We should also not fail to notice that Greece also had to raise 2 billion euros in debt via a private placement with banks last week, against a backdrop of credit downgrades and steadily rising spreads. The ECB undoubtedly agreed to this given the degree of policy coordination which must exist behind the scenes, since they are the ones who are financing the Greek banks, but it does highlight just how things have moved on in recent months, since only last year it was imagined that the Eurozone in and of itself gave protection from this kind of financing crisis, which was why only eurozone non-members, like Latvia and Hungary, were sent to the IMF. Now it is clear that while the ECB could keep protecting Greece from trouble till the cows come home, they cannot simply keep financing unsustainable external deficits and retain credibility. In this sense the financial crisis has now “leaked” into the Eurozone. And this has implications I would have thought, for countries like Estonia, who see eurozone membership as a “save all”. And obviously, the EU authorities badly need to plug this hole in their armour, or the entire concept of the eurosystem can be placed at risk, which is why I think we won’t see an explicit slackening in the minimum acceptable rating criteria." So a very large credibility issue is now looming, and one which is leaving a gaping hole waiting to be plugged in the outer defences of the Eurozone. One of the policies which will undoubtedly be applied by the EU authorities in an attempt to bring this situation under control will be one of being seen to favour the "good students" against the flunkers. By good students here we may think in terms of countries like Estonia and Ireland. Estonia is clearly going to be "rewarded" in some way or other for its "solid performance" in the face of the crisis (if that is, it isn't inadvertently dragged kicking and screaming off that same cliff from which Latvia seems destined to fall), while Ireland, will receive all the protection the ECB is able to offer, and that, as I am stressing, is plenty. M Trichet's strident insistence that EU countries were like US states would end up being rather hollow if the eurosystem were to prove incapable of offering aid to one of its members who was following instructions and struggling for survival. As in the case of Spain, a large part of the Irish debt is owed to foreign banks and bondholders who, rather than domestic Irish depositors, were responsible for funding the property boom. And, as the FT's John Murray Brown points out, the net indebtedness of Irish banks to the rest of the world rose sharply, from 10 per cent of GDP in 2003 to 60 per cent by early 2008. But while the very survival of both Irish banks and Spanish Cajas has been increasingly questioned, the Irish government has stepped in to shore up their asset side by agreeing to take over the worst of the sector’s property loans, via the creation of the new National Asset Management Agency (NAMA), in way which contrasts strongly with the Spanish authorities who have simply limited themselves to denying there was any real problem. Despite all the jitters about Irish sovereign debt in the light of the forthcoming annual fiscal deficits, what debt investors are really concerned about is the state’s huge contingent liability following the decision in October last year to guarantee all deposits and most debt of the five biggest banks. Analysts calculate that if there were a run on the Irish banks, the state would not realistically be able to find the 400 billion euros – an amount twice the size of Irish gross domestic product – the might need to meet their potential obligations under the guarantee. But this nervousness is to miss the central role the ECB would play in just this situation (should it arise, which it probably won't due to the credibility of the ECB guarantee). If the ECB were not able to shore-up Irish finances in times of crisis, then I think the Eurosystem would already be history. But Spain is a very different problem, and a much bigger threat, not only because of its size, and the size of the debts, but also because Spain, unlike Ireland, is turning a deaf ear to European Council "advice". The banks have accumulated large quantities of houses and land on their balance sheet, and no one knows their actual value. And there is a stock of around one and a half million unsold new properties awaiting buyers who may never arrive. And with the continuing inaction, the nervousness only grows. As Bloomberg's Charles Penty points out in an excellent review article, the “skeletons” on the balance sheets of Spain’s banks are making many fund managers averse to the acquisition of stocks with a strong dependence on the Spanish internal market . He cites the case Alvaro Guzman, Managing Partner with Bestinver Asset Management, whose funds have been the best Spanish performers over the past decade. 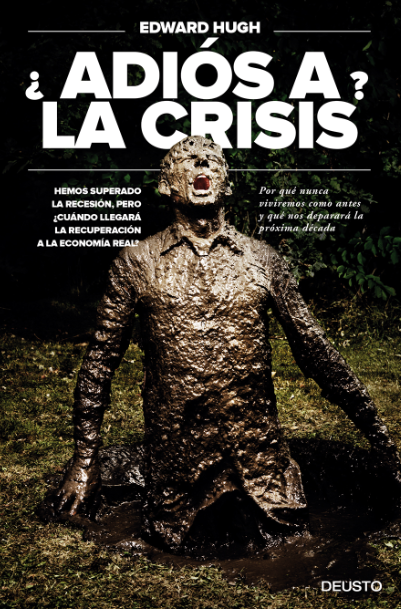 Among Bestinver's concerns is the fact that the crash of the Spanish real estate market, which caught banks with 324 billion euros in loans to developers, will limit economic growth and tax revenues (an echo here of S&P), perhaps forcing the need for an eventual bailout by Germany (or France). And, of course, Bestinver's view is far from an isolated one. Penty produces another telling quote, this time from Jim O'Neill, Chief Global Economist with Goldman Sachs, who told Bloomberg radio that it was going to be important to see whether further damage to Greece’s credit ratings sparks a “cascading game” where the “market just starts going after Spain or Portugal." You bet it is going to be important! Evidently Europe's institutional structure is in for a very testing time, and new and imaginative initiatives are going to be needed. Sovereign risk has now spread from non-Eurozone countries like Latvia and Hungary, straight into the heart of the monetary union in cases like Greece and Spain. Mistakes have been made. As I argued in my Let The East Into The Eurozone Now! 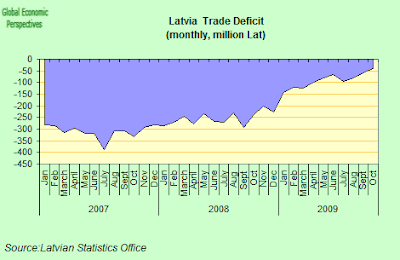 piece back in February 2009, the decision to let the Latvian authorities go ahead with their internal devaluation programme never made sense, and the three Baltic countries and Bulgaria should have been forced to devalue - the writedowns swallowed whole - and admitted into the Eurozone as part of the emergency crisis measures. This situation has simply been allowed to fester, and in addition the much needed change in the EU institutional structure - to allow Angela Merkel the power she is asking for to intervene in Parliaments like the Latvian, Hungarian, Greek and Spanish ones, as and when the need arises - has not been advanced, with the result that we are increasingly in danger of putting the whole future of monetary union at risk. It is never to late to act, but time is, inexorably running out. As the old English saying goes he (or she) who dithers in such situations is irrevocably lost. 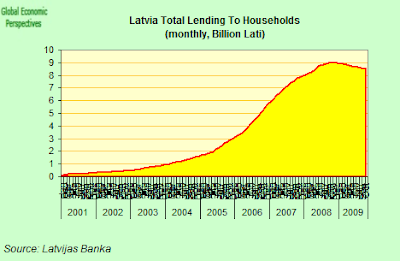 The Latvian government is getting nervous about the level of lending coming from Swedish banks. According to the Financial Times, "Latvia’s prime minister has warned Swedish banks they risk choking off recovery in the Baltic state’s crisis-hit economy unless they resume lending". The Latvian authorities are complaining, it seems, that banks such as Swedbank and SEB, which dominate the Latvian market, have reined in credit as they struggle to contain rising bad loans amid the deepest recession in the European Union. Well, here is some of the background. 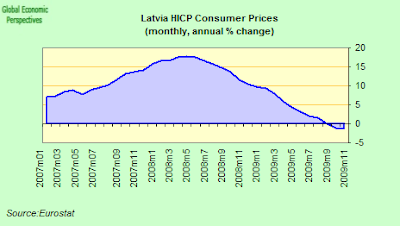 After an extended period when private credit was rising at nearly 60% a year, the Latvian credit bubble suddenly burst, with very unpleasant consequences for everyone. Since mid 2007 the annual rate of new credit has been falling rapidly, and turned negative in June this year. In fact total credit has been falling since October 2008. 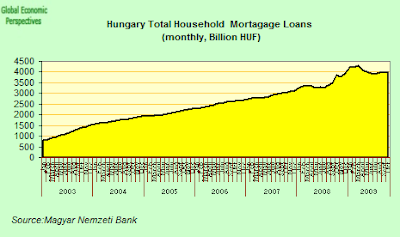 Lending to households alone has also fallen back, after shooting up dramatically over several years. 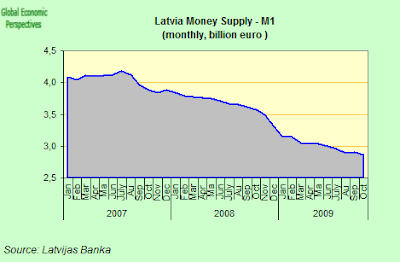 And Latvian base money (M1) has also been falling. In fact, and unsurprisingly (given that it is what we are seeing everywhere in the exploded bubble economies) the only sector which isn't deleveraging at this point is the government one. So it seems hard to me to simply blame mean banks for not doing enough about a situation which many saw coming, but few were willing to do anything to avoid. Sure, the banks made a lot of bad decisions, but so did many other people, and each and every party is trying to extricate themselves from the mess as best they cab. 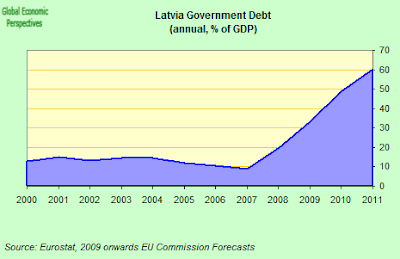 In fact total Latvia debt is not in fact falling at this point in time, since while many individual Latvians have been frantically deleveraging, the government has been borrowing at a faster rate than ever, in part to bail out Parex bank, and in part to fund the ongoing fiscal deficit. 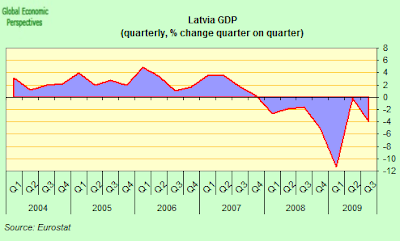 In the meantime Latvian GDP has dropped sharply, falling back again in the third quarter at an even faster rate than in the second one. Which means that despite the fact that private indebtedness is falling, the level of private debt to GDP is still probably rising. This unfortunate situation is only further reinforced by the fact that prices are falling - not too fast as yet, only an annual 1.4% in November, but they are falling, and they will fall further, and this means that the percentage of debt to GDP will again rise, and this is especially bad news for the Latvian government (even though the drop in prices is a desired objective, no win-win strategy left to use now) since any fall beyond that anticipated is likely to push up the total debt level of 60.4% of GDP currently being forecast by the EU Commission for 2011. And the pain doesn't stop, since having cut 500 million lati ($1 billion) in spending in its 2009 supplementary budget, the government initially resisted the idea of finding an additional 500 million lati of savings in the 2010 budget arguing that with no policy change the deficit was expected to be lower than the 8.5 percent target. Valdis Dombrovskis said in October his government could cut only 325 million lati in the 2010 budget and still meet the 8.5 percent target agreed with international lenders. The lenders did not agree, and Swedish Premier Fredrik Reinfeldt even intervened to tell Latvia it “must correct” its deficit. Following the rebuke further measures were passed equal to 500 million lati for 2010, and the country now targets a deficit of 7.6 percent of GDP. This is to be followed by a budget deficit target of 6 percent of gross domestic product in 2011, in order to finally arrive at the magic number of 3 percent deficit in 2012. But considerable doubt exists over the ability of the Latvian authorities to fulfil these objectives. Which is why Mark Griffiths, IMF mission head in Latvia, describes the situation facing the government as challenging, and why the EU Commission base their Autumn forecasts on much higher deficit levels. 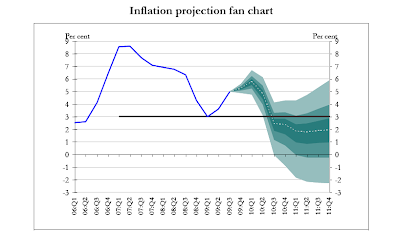 The problem is that with domestic prive deflation (which is, remember, what Latvia is aiming for, the so called "internal devaluation" what is called nominal GDP (that is current price, unadjusted GDP) is likely to fall faster that the so called "real" GDP (adjusted for inflation) and this has two very undersireable consequences. In the first place debt to GDP goes up even faster, and the revenue which government receives (which is based on actual prices) drops faster than GDP, causing more instability in public finances. 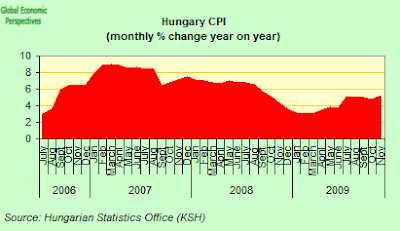 The deflator has shown falling prices since early this year and the EU commission is forecasting a drop of 5% for 2010. So basically, in this climate, with unemployment rising, and wages falling, and an economy contracting at nearly 20% a year, it isn't hard to understand why not that much new bank lending is going on. Those who are creditworthy are trying hard to save, while those who need to borrow normally aren't that creditworthy, so Dombrovskis' plea is rather like asking the bank to subsidise new bad debts, and that is really not something you can do, and especially not when you are going along the course you are following because you wanted to, and against one hell of a lot of external advice. What kicked the whole process off was a short sharp credit crunch, but now it is the contraction in the real economy which is following its own dynamic, till someone finds a way to put a stop to it. It is the drop in output that is preventing banks from lending, and not banks being unwilling to lend that is causing the contraction to continue. But there is another point in the FT article which should give food for thought. Mr Dombrovskis...ruled out devaluation of the lat. While breaking the currency’s fixed exchange rate with the euro would help Latvia’s exporters, it would increase the burden of euro-denominated loans, which account for 85 per cent of lending, he said. 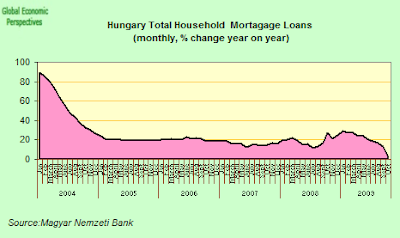 Well, we haven't advanced too far in all these months, now have we, if we are still wheeling out the argument that "external" devaluation will hit holders of euro denominated loans, since it should be generally recognised that the (very painful) internal devaluation which is now taking place is hitting Euro loan and Lati loan holders alike. And the argument is a strange one to use just shortly after the statistics office announced that due to the rapid reduction in the number of those employed and to the fact that many of them changed their working conditions from full-time to part-time, the number of hours worked in the 3rd quarter of 2009 fell by an annual 27.3%, while labour costs fell during the same time period by 30.1%. This fall in disposable income, and the continuing prolongation thereof, poses a far greater threat to the continuity of Latvian loan payments than the 15% reduction in the value of the Lat as compared to the Euro which the IMF proposed in the autum of last year would have done. Indeed, it is, in and of itself, one of the pernicious consequences of having resigned yourself to an "L" shape non-recovery. Stress on the banking system only goes up and up, as incomes and employment fall, and the government has less and less ammunition left to counteract the contractionary pressure. It is like sitting it out in freezing weather at the North Pole, in the vain hope that help will arrive. But help will not arrive, and the cruel truth about the post-crisis shock world we live in, is that nobody is coming to help you if you will not help yourself. In this sense, what Latvia doesn't need is more international borrowing (hasn't there been enough of that already) but some kind of meaningful strategy to start paying back the debt. But this means putting people back to work, and selling abroad, and financing Latvian lending from Latvian savings, and not pleading for yet more capital inflows to finance non-productive activities (attracting investment would be another matter, but as things stand right now the environment is far from "appetising", and according to the latest data from the Statistics Office, non-financial investment in Latvia was only 402.8 mln lats in the third quarter, a fall of 39% on the 3rd quarter of 2008). And just to be clear, what we have seen to date is not a 30% drop in unit labour costs (which would, of course, mean a great boost to competitiveness), rather it is a drop in earnings due to the fact that the output people could have produced just isn't needed, since no one is willing and able to buy it. In fact according to the data of the Statistics Office to hourly labour costs fell by only 3.9% in the 3rd quarter when compared with the same period a year earlier. Hardly a massive drop, and especially not when the large annual increases of ealier quarters are taken into account (see chart below). The internal devaluation has a long course still to run! But Latvia is back in the news today for more reasons, since the constitutional court has just ruled against the government pension cuts, drawing a question mark over Latvia's ability to meet the terms of its international lending commitments. "The decision to cut pensions violated the individual's right to social security and the principle of the rule of law," the court said in its judgement, which cannot be appealed. The pension cuts - in place since July - formed a vital part of the Latvian government's list of austerity measures, as it struggles comply with terms of the IMF-lead bailout, and the constitutional inability to implement them is another hammer blow against the credibility of the current Latvian administration. According to the Baltic Course, Valdis Dombrovskis told Latvian State Radio that the Constitutional Court's ruling on pensions must be carried out, and not debated. I am sure this will really come as music to the ears of people in Brussels and Washington. Basically pension reform forms a key part of the mid term strategy for sustainability of Latvian finances, and without the ability of the Latvian government to carry these out, then frankly the coherence of the whole strategy falls apart. If the Latvian constitution does not permit pension changes, then the Latvian constitution has to be changed, and the only surprising thing is that all this wasn't forseen when the initial loan negotiations took place in late 2008. Basically, it is impossible for the EU Commission and the IMF to accept any other view, since if any state could ring fence a whole part of social provision before entering debt negotiations, then non of the structural reform programmes could possibly work. This may seem harsh, but it is the price you have to pay for becoming insolvent as a society. 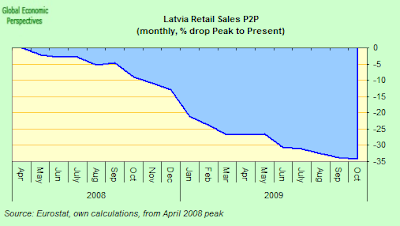 Latvia's problems are NOT short term liquidity ones, but problems of the sustainability of an entire economic and demographic model, and, as in the case of Greece, these problems will not be solved by two or three years of (rather painful) fiscal deficit cosmetics. Real changes need to be made, and especially in raising the long term growth potential of the country, and frankly it is these changes which we have yet to see evidence for. The issue is not simply one of limping into the Euro in 2012, even if as Mark Griffiths, the IMF’s mission head in Latvia, said in Riga last week the Latvian government does face a lot of “hard work” in trimming the budget deficit enough to qualify for euro adoption, and how much more so if they cannot constitutionally implement the cuts they agree to. Oh yes, and Latvia was also in the news yesterday for another reason, since Latvian stocks dropped the most among equity markets worldwide as small investors sold stocks before the government starts to tax investment gains. The OMX Riga Index fell as much as 4.3 percent to 271.55, its lowest intraday level since August 21. In dollar terms, the drop was the biggest among 90 benchmark indexes tracked by Bloomberg. 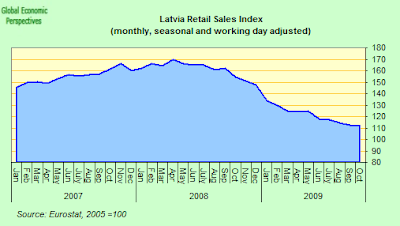 The reason for the sell off was that Latvia’s 2010 budget includes measures which will impose taxes on dividends, gains from trading stocks and bonds and interest income. These measures were agreed to in order to ensure the continued transfer of the 7.5 billion-euro bailout from the European Commission and the International Monetary Fund. Latvian investors have increasingly sold their holdings ahead of the Dec. 31 deadline. Dividends and interest income will be taxed at 10 percent, while tax on gains from trading stocks and bonds will be 15 percent. 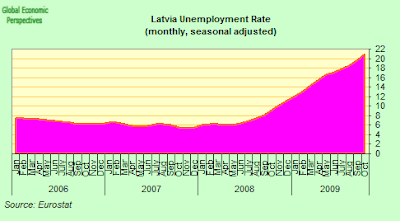 Finally one that wasn't in the news, but should have been, since while everyone knows that at 20.3% Latvia's unemployment is the highest in the European Union (see chart below), what they don't know is that more Latvian's than even are now being forced to leave their country in search of work. According to a report by Oļegs Krasnopjorovs, economist with the Bank of Latvia, during the first half of 2009 8,300 Latvian residents left for Great Britain, a twofold increase over the year earlier period. 3,600 people emigrated to crisis-ridden Ireland in the first 11 months of 2009 - 3% more year-on-year. Among the new EU member states, Latvia has seen the sharpest increase in emigration to these two countries. According to Krasnopjorovs, the data (which comes from the UK and Irish social security systems) confirm the trend identified by the Latvian Statistics Office, who examined data on long-term migration. In the first ten months of 2009, the number of long-term emigrants was 6,300, up 18% more year-on-year; moreover the steepest rise took place in the last few months, reaching a ten-year peak. For several years now the number of emigrants has exceeded that of immigrants in Latvia, with the exception of the second half of 2007 when a sharp rise in salaries and a steep drop in unemployment were fuelled by the credit and construction boom, leading to labour force shortages and the expectation that incomes would rise even further. The real problem here, of course, is that the Latvian economy remains mired in deep recession, and shows few signs of real recovery, something which is not surprising given that domestic consumption is in limbo land (where it is likely to stay), while the Prime Minister seems to attach little priority to boosting exports, and regaining competitiveness. 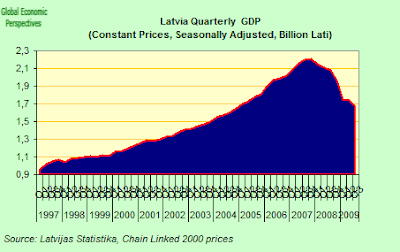 Indeed, the contraction has rather gathered than lost momentum in recent months, and on a seasonally adjusted basis Latvian GDP fell another 4% between the second and third quarters of 2009. 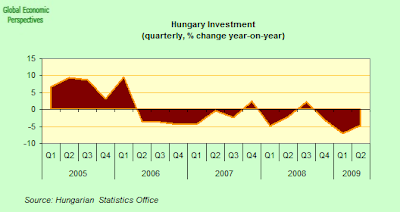 This was much faster than the 0.2% contraction between Q1 and Q2. Year on year Latvian GDP fell by 19.0% in the third quarter.The decrease was largely due to a 28.7% drop in external trade (share in GDP 15.6%), a 18.2% one in transport and communications (12.5% GDP share), an 17.4% fall in manufacturing (10.2% GDP share, incredible) and by a 36% drop in construction (7.5% GDP share, not far below manufacturing). Private final consumption fell by 28.1%. 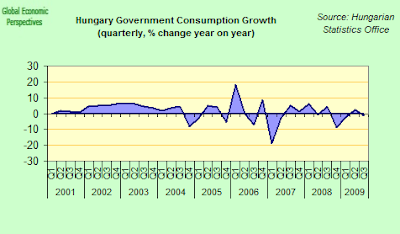 Government final consumption decreased by 12.4%, while expenditure on gross capital formation fell 39.4%. 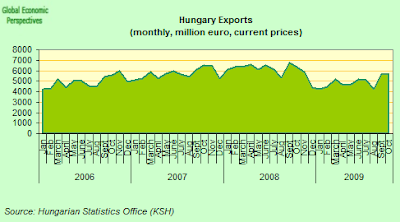 Goods exports (68.2% of total exports) fell by 11.7% and services exports by 20.5%. 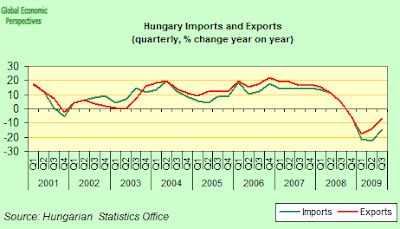 Goods imports (82.1 % of total imports) were down much more sharply - by 36.6% -and services imports by 29.1%. Which meant net trade was positive, otherwise the fall in GDP would have been greater, and nearer to the levels seen in domestic demand. And entering the fourth quarter there were few signs of any real improvement. Retail sales fell in October by 1.3% from September (on a seasonally adjusted, constant price basis). As compared to October 2008 sales were down by 29.1%. The drop was even larger in the non-food product group – 32.3%. 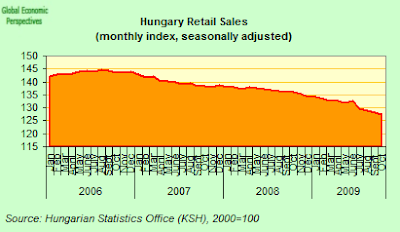 According to Eurostat data, sales are now down nearly 35% from their April 2008 peak. Industrial output, however, seems to be holding up a little better, and output has stabilised since the spring. The problem is that manufacturing industry is now such a small share in GDP that it will be hard to pull the entire economy on the basis of anything other than very strong rates of increase. Industrial production was up in October by 0.1% over September, marginal, but at least it wasn't a fall. Unfortunately most of the increase was in the energy sector, with electricity and gas up by 10.3%, mining and quarrying contracted, by 2.1% as did manufacturing, by 1.9%. Compared to October 2008 industrial output was down by 13.5%, Output in manufacturing fell by 15.8%, in mining and quarrying by 11%, while in electricity and gas output was only down by 2%. Output is now down around 21% since the February 2008 peak. 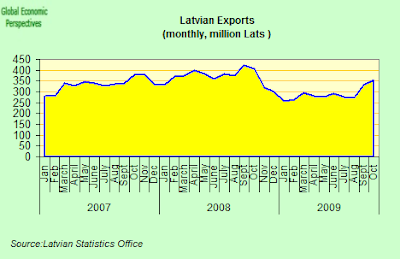 There is one positive glimmer on the Latvian horizon at the present time, and that is, of course, exports which were up by more than 4.4% (or 31.7 mln lats) when compared with September. 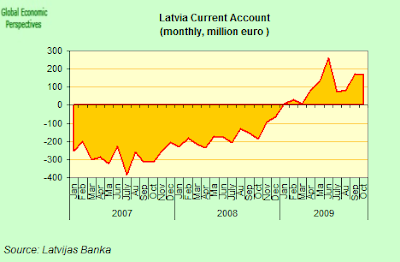 As a result, the surplus in the current account of Latvia's balance of payments reached 10.1% of gross domestic product (or LVL 327.9 million) in the third quarter. The surplus is however rather smaller than in the second quarter, which was 14.2% of GDP. With export growth exceeding that of imports, the combined goods and services balance was positive for the second consecutive quarter, standing at 0.3% of GDP (or LVL 11.2 million). This effect is more due to services than to goods exports, since the goods trade balance is still in deficit (see chart), so there is still a long road to travel. The largest third quarter capital inflows registered under the capital and financial account were the result of government borrowing from the IMF-lead support programme. There was some new foreign direct investment in Latvian companies to the amount of LVL 370.2 million, which to some extent offset direct investment outflows. Net external debt shrank by LVL 0.5 billion in nominal terms, but due to the fall in GDP (as I explained earlier) the ratio of net external debt to GDP posted only a tiny drop, reaching 56.4%, and gross external debt to GDP (excluding foreign assets) was up, reaching 145.8%. So, as I say, a start has been made, even if there is still a long, long road to travel. 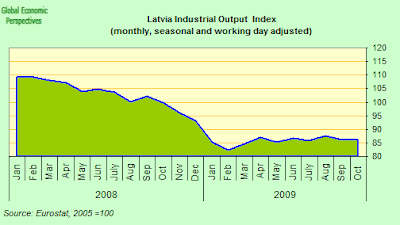 Internal devaluation is the chosen path of the Latvian people, the best thing I can suggest at this point is to get it moving in earnest (in fact there is some evidence from November producer prices that the rate of price fall is now accelerating), and that Latvia's leaders start to value what they have (that is, export potential) instead of dreaming of what they can no longer have (dynamic domestic consumption driving growth). Living in the past is never a good idea, not even in the sentimental moments of Yuletide. A Merry Xmas to you all!